Posted by James Sanden on 1:11 pm in Wedding Entertainment Ideas | Comments Off on Magic at a wedding? As a Chicago magician and corporate entertainer, most of my performances are at private parties and corporate events, but this summer I’m finding myself performing close up magic at more and more wedding receptions. That may sound strange, but it’s an excellent way to entertain your guests that requires no additional logistics to manage. And the audience is a perfect mix of friends and family ready to have fun (without having to worry about embarrassing themselves in front of coworkers or the boss.) To top it off, I have a piece of magic I do exclusively at weddings that leave the bride and groom with a magical souvenir they’ll never forget. So if you’re getting married (or know someone who is), give me a call! I’ll help make the night fantastic! People tend to think of magicians for a birthday party show or to provide sleight of hand magic as corporate entertainment. What they seldom think of is using the power of magic as a metaphor to communicate a message. In particular, I’m talking about sales meetings and trade shows. Anyone who has been to a sales meeting or attended a trade show knows how dry and boring they can be. Some companies hire celebrities or comedians to draw a crowd, but while their clients are entertained, they generally don’t walk away educated about the benefits of their product or service. And the same principles apply with sales meetings and other corporate events that need a message communicated powerfully, effectively, but also with entertainment. 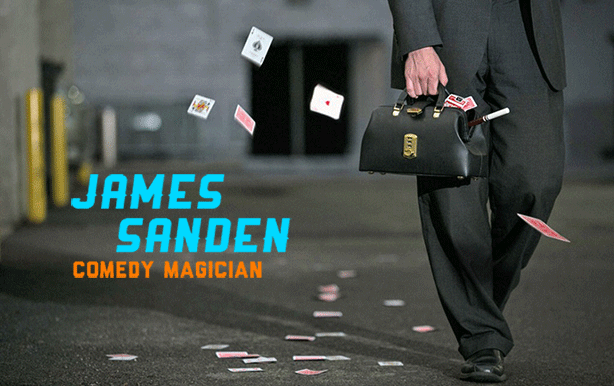 So in addition to considering this Chicago magician for your corporate entertainment, think of my magic show as a way to bring more profits to your company though the incorporation of your company’s message. You’ll be surprised by how effective it can be. Posted by James Sanden on 2:02 pm in Corporate Entertainment | Comments Off on Welcome to my new site and blog!